The Bringing Them Home Committee (WA) and Yokai: Healing Our Spirit are proud to bring you the Sorry Day Twentieth Anniversary Concert at the Astor Theatre from 6:30pm Friday May 26, 2017. The concert features Archie Roach with support from local Aboriginal performers Gina Williams, Della-Rae Morrison, Candice Lorrae, Beni Bjah and the Madjitil Moorna Choir. 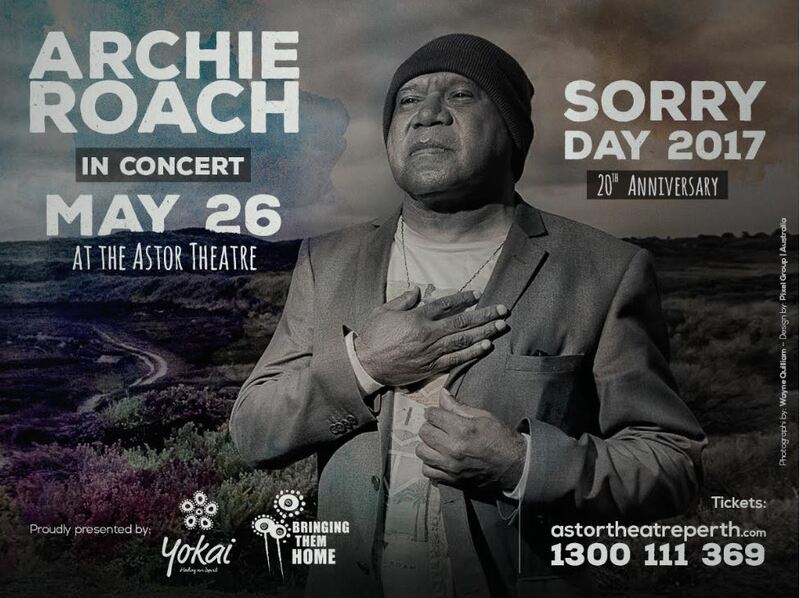 Archie Roach is a multi-award winning Aboriginal singer/songwriter who is best known for his advocacy for the Stolen Generations and for his song “Took the Children Away”, which has become the anthem for the Stolen Generations. Gina Williams, Della-Rae Morrison, Candice Lorrae, Beni Bjah are also award winning singers and songwriters so this is going to be a very special night showcasing some of the best Aboriginal performers in this country. Production for the night is being coordinated by well-known Noongar performer Phil Walley-Stack! This is a significant anniversary for the Aboriginal and Torres Strait Islander community as it commemorates the Twentieth Anniversary of the tabling of the Bringing Them Home Report in the Commonwealth Parliament. This landmark report into the Stolen Generations highlighted the past practice of removing Aboriginal children from their families and the ongoing impact of those policies. Most of the performers at this Twentieth Anniversary Concert have family connections to the Stolen Generations and they will be joined by Stolen Generations survivors and their families to acknowledge this anniversary. Please come along and join us for what promises to be a memorable night! Sorry Day 2017 is nearly here! Thanks for making the Sorry Day 20th Anniversary so special!